Before 2010, the JLPT was a very different animal. It was a much simpler time and it was a much simpler test. The old test was much loathed, but still respected as the test to take to prove your Japanese proficiency or at least the only one that employers took seriously. There were several benefits to the old test – you could get last year’s test at a discount and use it to practice and study up for next year’s exam. The list of vocabulary that was going to appear on the test was readily available. There were books that had stood the test of time that could help you prep for the test. In short it was somewhat easy to master. But, it also had a lot of problems. It was widely criticized for not being very practical, which it wasn’t. The listening was especially very test-only like and didn’t mirror anything you’d see out in the real world. Also, the jump between 三級 and 二級 was too much for a lot of students. So, it was revised. According to the test specifications, the old 二級 is suppose to be approximately the same level as N2. But, I’ve had a sinking suspicion that isn’t the case. I kind of have a hunch that in fact the N2 is more difficult than the old 二級. So, I decided to investigate. Cue Mission Impossible theme music here. I took a 二級 practice test and then a N2 practice test. I took them on two separate Sunday afternoons. For both, I adhered to the times allotted for each section of the exam. I should note that I have actually taken both of these practice tests before. The 二級 practice test, I took about a year ago. The N2 practice test, I took about 6 months ago, but I didn’t really remember much from the time before. Just for reference, I used Ask Publishing’s N2 mock test. The 二級 mock test I took was published by Unicom, but is no longer in print. There are pretty big noticeable differences between the old test and the new test. These changes were put in place mostly because the test was being criticized for not being very practical. The idea is that with these new changes, it is more of a true test of the Japanese language and not simply how to read kanji or understand vocabulary (which the test was more heavily weighed toward in the past). I noticed that the kanji and vocabulary sections are considerably easier on the 二級. I think this is mostly because the 二級 focused on a much broader range of kanji, some of which was more commonly used. I did pretty well on the kanji section (35/40) and vocab sections (17/25) of the test. In total, I got a 52 out of 65 or 80% for the vocabulary/kanji section of the test. Not too shabby really. For the N2 practice test, I fared a lot worse (20/32). 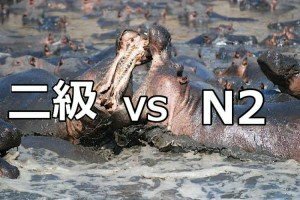 The N2 has a lot fewer vocabulary and kanji questions, 32 for N2 compared to 65 for 二級　making the vocabulary and kanji section a lot less significant for the new test. The major difference between the old test and the new test is that instead of asking you about several kanji in one sentence, they only ask you about one kanji. This makes the test a lot less about being able to read kanji and more about how to actually use the vocabulary, I think this makes for a lot more practical test of Japanese. Before you could just drill kanji readings incessantly to the point of nausea and then throw them up on the test. Unfortunately for slackers, that is no longer the case. If you are using the old tests to prepare for N2 though, I think they will be a good warm up for the vocabulary and kanji sections. 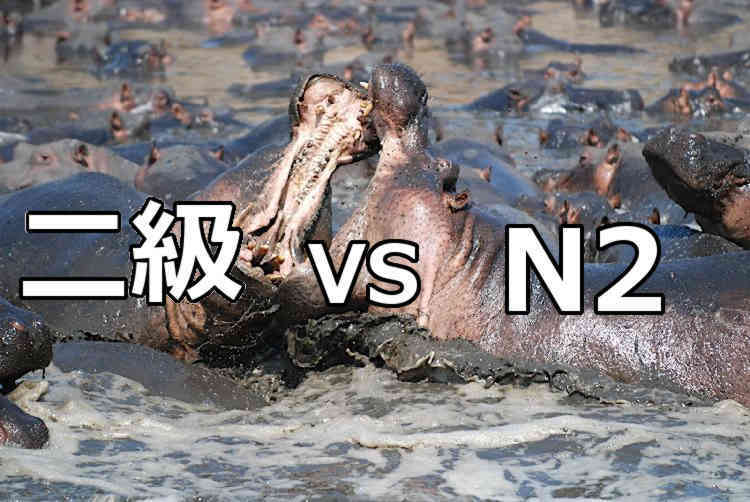 Just keep in mind that the N2 will be a lot tougher and ask about the more difficult kanji. The reading and grammar section of the old 二級 was actually the last section after the listening which was in the middle. There used to be two breaks while taking the test. This made the ordeal a whole lot easier to manage. Now, the N2 has the vocabulary, kanji, grammar and reading section all in one session. This makes for 105 minutes of test taking goodness. For the old 二級, I was quite proud of my grammar score of 56/72 or 78%. It surprisingly left me with a feeling of accomplishment, but the 二級‘s grammar section was a lot simpler. All you have to do is choose the correct grammar that fits the sentence. Again, not very practical. The N2 grammar section has added two more sections, the scrambled sentences and the text grammar. I’m not sure how practical the scrambled sentences are, but they do make you think about Japanese sentence structure. This has helped me to realize a lot of mistakes I used to make when speaking. It especially helps you think about how different parts of speech interact with each other. The text grammar was indeed a smart idea. This allows the test to check your ability to use the grammar that’s needed to string ideas together. This section deals a lot with context and the flow of writing, which is important for more advanced users of the language. I got a fairly disappointing 12/21 or 57% on the N2’s grammar section. This is a big difference from the 78% I got on the 二級. I missed the most points in the first section though, the one that is most like the old test. I only got 50% of those questions right. Looking back over the test, I think more grammar points are covered in detail on the N2 than they are on the 二級. In particular, be on the look out for expressions using こと and もの, like ものだから vs. ことだから. I think for the kanji and vocabulary sections, you can definitely take the old tests to prepare for the exam. However, you will have to do a little extra work for the grammar section. It involves a lot more attention to structure and flow of the passage. The best book that I’ve used to help deal with these new questions is the New Kanzen Master N2 Grammar book. There are whole sections devoted to each type of question that goes over patterns to look out for and reviews some grammar. The only issue I have with it is that there are no explanations for the answers. This makes it a better book for someone that has a tutor or at least a native speaker friend to ask questions to. Having said all that though, it is a good book and will definitely prepare you for this tough test. That’s it for part 1 of this post. Next week, I’ll go over the reading and listening sections as well as a summary of some of the key differences. Stay tuned! What is your experience with the old tests? What did you find is different about them from the new tests? Let me know in the comments below. P.S. Do you like taking the 二級? Hey, me too! Sign up for the newsletter! P.P.S. Prefer the N2? Then try joining my Facebook Page for all the latest updates. Thank you for clearly explaining the differences.